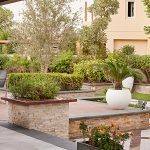 Water fountains Dubai: Create amazing focal points for the backyard. Build a tranquil water feature and create a relaxing retreat in your own yard. Water fountains appeal to a number of our senses – sight, sound, touch and movement. Water fountains Dubai: Please watch this 100 second video below for examples of water features you too can have. Or jump directly to the text below. Fill in your name & email ID in the box on the right to have Sejal call you for water fountains Dubai. A wonderful way to revitalize your garden is to install a water feature such as a fountain or garden pond. These additions are both soothing and aesthetically pleasing. Installing a water fountain will contribute significantly to the ambiance of your garden. Water fountains are most often incorporated for the visual and audible tranquility they provide. It is amazing how just being near an active water fountain improves a mood and delivers a healthy positive energy. There is nothing more soothing than relaxing on a bench in the backyard and taking in the tranquil sound of a garden fountain while reading the newspaper or just shut your eyes and “chilling out”. Just being in a garden with an energetic water feature provides a meditative sensation, even if you’re not specifically trying to do so. Design After deciding to add a garden fountain, be sure to put some thought into choosing a style and design that will fit in well with the entire garden. If you will be using any other ornamental items e.g. benches, chairs, bird baths, gazing balls etc. make sure that the fountain coordinates well with your entire garden style. Does the water feature you are considering seem to be a natural component of the area or does it look completely out of place in the garden? If you have trouble deciding if the fountain will be a good fit, you might want to get the recommendation of someone who has a better feel for style and design elements to make an informed decision. Having a fountain in your garden is not only soothing, it also adds character to what otherwise would be a rather plain landscape. If a quiet and relaxing getaway located merely steps from your back door seems like something you would enjoy, why not seriously consider adding a water fountain to your garden? You’ll be delighted that you did. Other visitors to this water fountains dubai page look forward to seeing your comments in the space below. If you like what you have seen or read on this page share it with your friends by clicking on one of the social media buttons below.